Only in New York City is it easier to make your own apple juice/concentrate (for added pectin) than to schlep through groceries and health food stores trying to find commercial pectin in the barren season. NYC’dwellers aren’t notorious for being canners and preservers (though the tide is shifting!) so the spotty availability of pectin is not surprising in the least. Yesterday, finding no Pomona’s on my co-op shelf, I resolved to get crafty (another non-surprise.) I bought five small-ish Empire apples (from upstate, Hempstead Farm) and made juice this morning to add to my two Tigress Can Jam March recipes. The verdict is still out on whether or not these two jellies will set—the red onion one looks promising!—but it was exhilarating to take authority for the first time in a recipe and know that my jelly aspirations were not doomed from the outset. Quarter 5 small apples with blossom and stem ends removed (not cored). Put apple pieces in a saucepan with enough water to cover them. Bring to a boil, stirring frequently and then reduce heat, simmering at a low boil for about 30 min. Mash apples as you periodically stir the boiling mix. When apples are soft, remove pot from heat and strain the pulp over a cheesecloth lined strainer. Ahem, I’ll start by saying: this ingredient family stumped me. I flipped through the three canning books I own, indexing alliums of all sorts. The only thing that seemed appealing (and useful in our home) was jelly. Combine all ingredients in your heaviest-bottom pot. Bring to a boil and stir constantly to keep sugar from burning. My industrial-strength spatula is my new fave jelly/jam/sweet spread tool (thanks mama!) It’ll take about 15-20 minutes for this mixture to reach the 220 degree F gelling point. 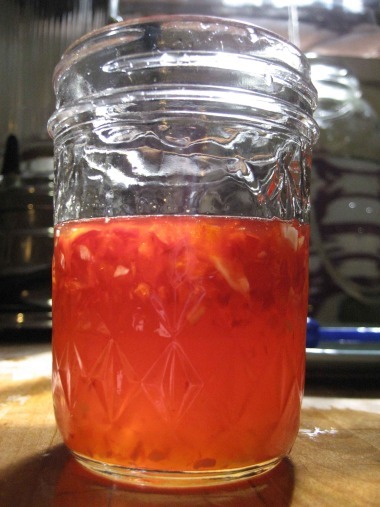 When the mix reaches 220 degrees, ladle hot jelly into hot jars. Method: same as above the sun is finally out!Recommendations for anyone who might attempt these recipes: I’d probably go ahead and include the third (recommended) cup of granulated sugar to both recipes. I dropped it to see what might happen (which may be a syrup-y marinade instead of a dual-purpose jelly/marinade.) Although, check back with me in a few days; the set might be just peachy after all. OR I’d experiment with making more of a true concentrate by doubling the apples and keeping water levels the same, a super-pectin cocktail! Kaela from the Local Kitchen just sent me a link to her pectin stock recipe! Score!! I am so doing this in the fall! Another question for the experienced jelly-makers out there: I had a frozen apple juice concentrate in the freezer, but shied away from adding it to the mix because of malic and ascorbic acid additives. Was this unnecessary? These alternatives are helpful for times when you can’t find pectin at the store, or if you just feel like venturing beyond the boundaries of modern convenience. To be clear, I don’t have issues with commercial pectin. Though it’s made by big machines in a factory, it’s fruit derived and seems harmless enough. Aaaand, the set: One of my books said jelly could take up to two weeks to set, but impatient as I am to assess success/failure, I’m ready to judge now, 2 days out. It looks like my red onion apple jelly has formed a loose set, and the red pepper garlic is definitely a syrup marinade! The two half jars of each variety that didn’t get waterbath canned both set the most firmly, but maybe that also has something to do with being in the fridge. On both jelly accounts I deem success. I can’t say I’d venture to drop my garlic mixture atop cheese and crackers anyway (it’s so intense!) Plus, a syrup makes marinading much easier, right? !